Technology should seamlessly blend into your home. We like when the trappings of our modern life are unnoticeable to our life. 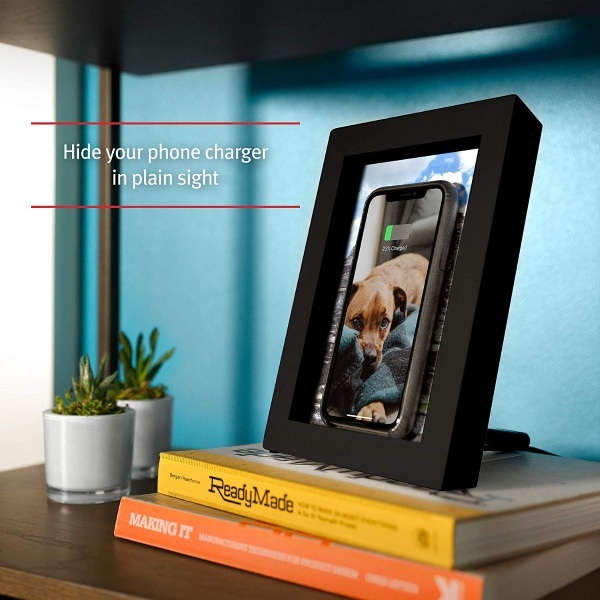 To that end, this cool Picture Frame Qi Charger blends perfectly anywhere. Hidden charging! At first glance, this looks like a thick picture frame, perfect for storing a photo of a loved one or tiny motivational quote. I don’t know how you decorate but it doesn’t matter because this is what it looks like, it’s a picture frame so when not in use, it actually serves a purpose! So I guess it’s always in use? It’s a Qi charger, put your phone against the glass and it’s off to the races. Just plug it in and it’s good to go. Plugs into USB, ready to work in seconds. It does work through most phone cases but does not charge through thick, rugged cases. Comes in black and white and can be yours for $62.11.